Antony Starr fans can binge on Banshee next month on Sky Box Sets, which also will premiere season four of Jane the Virgin and apocalyptic grindhouse romp Blood Drive. There’s a riveting explosion of creativity happening here. The word ‘grindhouse’ invokes the proud tradition of ultra-violence and insanity associated with that term. 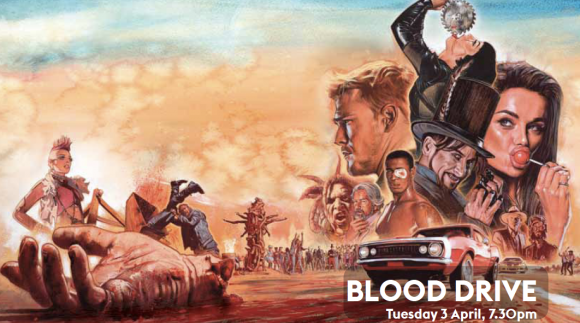 But beyond that, the fact that out of nowhere, Blood Drive will invoke genre concepts like robots and zombies is fascinating, broadening the narrative beyond the central race and its more meta elements. The Atlantic thought it “sloppy, silly, squirm-inducing fun” but added “the acting is generally weak and the writing is awful” while Entertainment Weekly said it “features a large amount of dismemberment and has the good grace not to take itself seriously”. Interesting to see Beauty and the Beast get a showing – from memory The Zone showed Seasons 1-3, but not Season 4? I believe you’re right, Aiden. The fourth season ended the series in the US 18 months ago. It doesn’t appear to have screened on The Zone but can be streamed (along with S3) on Sky’s Neon service. Didn’t Beauty and the Beast S4 appear on Box Sets in November last year?